Been raining here for a number of weeks now. No matter what, I go outside for my lunch break at work, holding onto an umbrella with one hand and a sandwich in the other. Standing under a tree. Otherwise I’m inside all day. Love the wind and winter weather. Not your typical Monday afternoon. Complained Friday about secret Paul gig only being available to those who could make a video saying why they should be there, woke up this morning to an e-invite to Abbey Road this afternoon. Along with Johnny Depp, Orlando Bloom and Kylie Minogue, and most McCartney children, watched Paul performing in Studio Two. Feckin' hell! Still have big feckin' grin on face. Not sure it will leave for a month or two. I'll write more when I've had a chance to process properly. Still jaw-dropped at my Monday afternoon. OMG!!! That is AWESOME!!! My heart is racing! I am so happy and excited for you!!! Looking for work again - contract done. 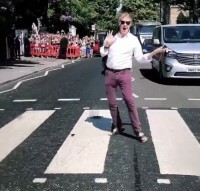 Did you just say you were one of the incredibly lucky people to be at Paul's secret gig at Abbey Road ? That is so, absolutely, incredibly, magnificently amazing!!! Unbelievable experience! Look forward to hearing more, especially what songs he performed. Incredible experience, @Ron Nasty! I'm not jealous*, just happy for you. That’s awesome. Well done, it’s a great feeling. I got my licence on my birthday. As early as possible I could get it. ^ I was very different. I did horribly during the driving part of my exam, but the guy could see that I only wanted my license to have a picture ID to take the university entrance exam so he let me get my license. I eventually learned to drive. Now, I love driving. Haven't posted on this thread for a while, but other than going to the record store to buy The Beach Boys In Concert album, I haven't really gone anywhere worth posting about these past few weeks. I dreaded leaving the house during the World Cup because I hate football and knew I'd have to endure at least one person singing that stupid "football's coming home" song out loud, so I'm glad that finished. However, I have been excited about the prospect of doing the music course, meeting new people and hopefully making friends when I go to college in September. What would be in the music course you're thinking about @SgtPeppersBulldog? Performance? History? Something else really cool? Well on the open evening they did back in March (I think), they showed us that we'd be using computers, midi keyboards and Reason for some things, but there is also a practice/performance room across the hall. We had to perform for one of the teachers in there to show we were eligible for the performance part of the course , so I did House of The Rising Sun on their electric guitar, which was already my chosen piece for my secondary school mock exams I was doing at the time. Something I would like to do is their enrichment clubs where you can join a band or stay behind after lessons to practice. Heck, maybe I could record some stuff there to send to you and Martha for our project if I did that! I'd also definitely like to introduce some people there to this forum too. That sounds like massive fun! I reckon you'd enjoy that immensely, it certainly sounds like you will. Where I stay there is currently the most insane thunder and lightning going on outside. Easily up there with the most intense I've experienced. Visiting the fam in the ol' Peach State. I may be a little scarcer than usual for a couple days. Same here. Back for a tragic funeral, but it is nice to be home. I’m going to a Braves game with my dad. Its been years since i’ve done that. I’m trying to catch up on the forum but its near impossible with 100+ unread posts. In a week or two i’ll be through with my sunmer job and i’ll clear my unread posts and start posting again. Have fun, both of you. I'm cleaning like mad. Ahhh mom arrives Monday. Enjoy the game and see you on the forums again soon! Hope the funeral doesn't get you down too much swr.